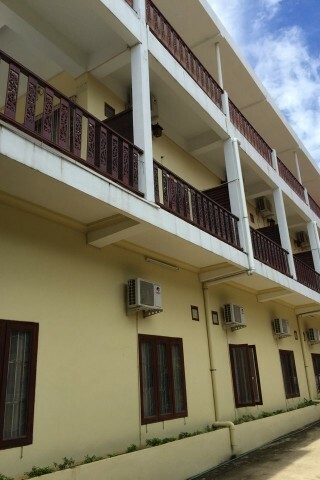 Opened in November 2012, this hotel is one of the newer style multi-storey monoliths that have become so prevalent in Vang Vieng over the years. Ad Book now! Rates from US$20.66++. Average rating 6.9 from 98 reviews. Despite its businesslike exterior, Malany Hotel is actually a fantastic deal for flashpackers. The rooms are all naturally well lit by the windows connecting to the balcony, the beds are hard but feature crisp white linen, the TVs are flatscreen cable jobs and each room has WiFi access. Very high ceilings make it feel spacious. The rooms also come with air-con, tiny fridges, bedside table and very clean hot water bathrooms. The ground floor rooms have security bars on the windows. It’s a functional kind of place rather than a stylish or charming one, but it does this job very well. It’s located beside Inthira, the main entrance is on the side of the building. Breakfast is included in the rate. Check rates at Malany Hotel on Booking.com.